How will a Bouquet or arrangement arrive? Our flowers arrive in one of our signature green, eco-friendly, Real Flower Company branded boxes. The flowers are packed for transport in a fresh bag saturated with water. Opening our premium boxes, releasing the amazing scent and seeing the stunning flowers for the first time is a key part of the unique experience of receiving luxury scented flowers from The Real Flower Company. Our flowers come in a semi-open bud form to maintain freshness and durability while they make the journey to you. Please wait one to two days past the arrival date to see them in their fully open, finest state. Many people like to keep our flowers and enjoy watching them age beautifully and gracefully for well over a week. Just like humans, there is beauty in older flowers too! Why are your Bouquets more expensive than some other florists? Our pricing is as good as, or better than, any premium supplier of Fairtrade or English grown luxury scented flowers in the world. You might be able to find cheaper flowers at the supermarket or your local florists, or with an online competitor. However, you will not get the same flower quality or scent intensity for this price anywhere else. The flowers most supermarkets and florists sell have little or no scent, will be older by up to 10 days and the bouquets will probably be bulked out with cheap fillers. Everything, including flower food, care instructions and a gift message. The only thing not included is delivery. This is because some of our customers prefer to collect their bouquets from our workshop. While we aim to make every bouquet perfect, flowers grown as nature intended are not and slight imperfections and some occasional unpredictable behaviour is only natural. Similarly, we are only human and therefore, whilst we try our absolute best every day, we are not 100% perfect! However, we can assure you that we’re working our hardest to deliver your important gifts, messages and sentiments. We want to be sure you’re happy with us and our flowers, so, if we do make a mistake, we’ll make up for it by providing a Free Replacement delivery or equivalent Credit Voucher (or a partial Credit Voucher if appropriate) to ensure you’re taken care of appropriately, based on the nature and magnitude of our mistake. Basically, if we make a mistake, we will do everything we can to ensure you are happy that you chose The Real Flower Company. What’s covered by your Guarantee? Everything we do! Late delivery: If we don’t deliver by the day scheduled, we will provide a Free Replacement or equivalent Credit Voucher. The only exceptions are when our courier attempts delivery on time and the delivery cannot be made for some reason outside of our control. Examples of these exceptions include but are not limited to: an incorrect address; the recipient not being at home; the nominated place to leave the delivery not being available or not ‘safe and dry’; a business address being closed, etc. and severe weather. If we miss the delivery otherwise, we make up for it. Quality Issues: If for some reason our flowers arrive in substandard condition, we will provide a Free Replacement or equivalent Credit Voucher. This does not cover minor blemishes or if just a couple blooms or so are slightly damaged and simply require a few petals to be ‘picked’ off. Our flowers come in a partially open bud form to maintain freshness and durability while they make the journey to you. Please wait one to two days past the arrival date to fully assess their condition. Short vase life: If your flowers do not last five days, we will provide a free replacement. We will require relevant photos to be emailed to us within five days of delivery. However, this is subject to the recipients of our flowers having followed the simple Care Instructions we include. Inaccurate flower composition: If we make a mistake and send completely the wrong flowers, we’ll send a Free Replacement arrangement or provide the equivalent Credit Voucher. This requires a photo of the Bouquet and or message card within three days of delivery. Slight colour variations from the images on our website are common, and we do reserve the right to substitute some varieties with others due to availability or quality issues, so please understand that nature isn’t perfectly consistent and this may result in significant product variations; albeit we promise every bouquet we deliver will be beautiful! And what, unfortunately, is not? Just things that are beyond our control. Acts of God or Nature such as severe weather that causes delays, wrong or non-existent addresses. A minor blemish or a dropped petal or two: Flowers have natural variation and not every flower will be pristinely perfect. Nature gives us these imperfections to show us the beauty of it all and this is a part of the experience of receiving flowers from our small, British and Fairtrade farms rather than mass produced ‘factory’ flowers! Missing or incorrect notecard: If your notecard is missing or incorrect, we will be happy to send a personal, handwritten card to your recipient, and we'll provide a partial Credit Voucher for the inconvenience. While rare, it can happen that notecards are lost during transit so we want to be sure to make it up to you! How are you a sustainable and eco-friendly company? Our farms have been independently certified by third party agencies such as LEAF and Fairtrade as being responsible, sustainable and eco-friendly. Also, our farm-direct method ensures that very few stems are wasted in the supply chain, while other suppliers can waste up to one of every three stems. Our farms pay living wages and really care about and look after their employees which means you can feel good about shopping at The Real Flower Company. I love this! Is there some way for me to help spread the word? Yes! Please, please post our links to your social accounts to let others know about us! Please visit our Customer Service / Contact page to see the options available. What makes The Real Flower Company and their flowers so different? We believe flowers should smell amazing as well as looking beautiful. In order to do this, we curate and grow the most scented flower varieties in the world on our British and Fairtrade farms. These unusual scented varieties of flowers are difficult to grow and transport, so only specialist growers like ourselves are able to produce them. We only cut what we can sell, so our wastage is significantly less that most ordinary florists who waste a large percentage of stems that they buy. Our flowers are hand-picked daily and rather than spending days or even weeks in a cold store like most flowers. They are then sent to our workshop whilst they are still really fresh. Our florists then hand-tie them ready for a Next Day delivery of the freshest, most scented and beautiful flowers anyone could hope to receive! Why are The Real Flower Company flowers so much more scented than ordinary flowers? Most commercially grown flower varieties have been genetically modified by removing the scent gene in order to make them easier to grow, transport, and store as a mass commodity and to extend their vase life. As a result, they have little or no scent and do not open in the way that nature intended. The flowers we grow are ‘real flowers’ with their scent gene firmly intact. They will open fully to reveal their full glory and release an intoxicating scent that is unforgettable! Why do your flowers only last for five days? Most commercially grown flower varieties have been genetically modified by removing the scent gene in order to prolong vase life. As a result, they have little or no scent and do not open in the way that nature intended. The flowers we grow are ‘real flowers’ with their scent gene firmly intact. They may not last quite as long as some ordinary flowers but they smell amazing and add another sensory dimension to the experience of receiving flowers. How should I care for my Real Flower Company flowers? Our roses have a shorter vase life than their mass produced scentless rivals and will, as nature intended, open and start to shed their petals after about five days. There are however a number of things you can do to extend the life of your flowers. • Remove flowers from their protective film and pour away any the water. • Carefully remove any damaged petals from the outside of the roses. • Rinse the stems in clean water. • Cut 2.5cm from the end of the stems at a 45 degree angle. • Place your flowers into fresh water with the flower food sachet provided. • Display your flowers in a cool room, away from bright sunlight or direct heat. • For maximum vase life change the water every two days as bacteria in the water will shorten the vase life Our roses are guaranteed to last for five days if the care instructions are followed. How long should I expect my Real Flower Company flowers to last?Our flowers are cut and then shipped direct to you, so on average they will last a minimum of five days when care instructions are followed properly. Some flowers such as our sweet peas may up to two weeks after delivery! We specialise in unusual highly scented roses, sweet peas and other luxury flowers that are almost impossible for large scale producers to grow and transport. They are available in a large variety of colours and you can sort flowers by variety using the ‘flower types’ filter on our product pages. I really liked a Real Flower Company arrangement I saw on the website but I can’t find it now. Can you help me find it? Our collection of bouquets change frequently due to seasonality, availability, and trends. If you are searching for a specific arrangement, you can contact our customer service team at info@realflowers.co.uk or call 01730 818300 and they would be happy to help if they can! Why do your David Austin Bouquets cost more? We are the only authorised grower and supplier of David Austin cut stems if the UK. For this privilege, we pay a small royalty to David Austin which seems fair to us given how beautiful his roses are! 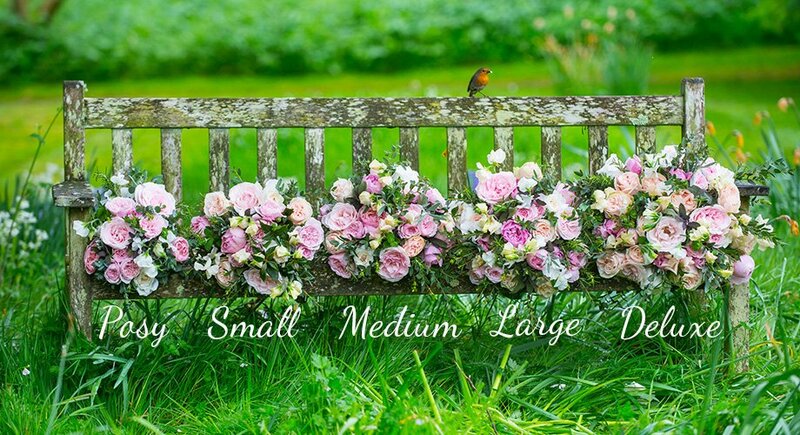 The slightly higher prices we charge for David Austin bouquets help us pay these royalties. Our standard stems are cut from our farms at approximately 40cm but this does vary depending on the arrangement and flower type. All stems will be trimmed by our florists once your hand-tied arrangement is finished and we recommend the flowers are trimmed again to the same length by recipients. This is an important part of our care instructions, but also enables the recipient to trim the stems to fit their own vase properly. I just placed my order, but another arrangement has just caught my eye! Can you switch my order to a different arrangement for me? No problem! Just call our Customer Service Team on +44 (0)1730 818 300 or email us straight away and we can help (as long as it is before 4pm on the day before the delivery date you selected). Can I customise my order and create my own bouquet or arrangement? Sure! Our Florist Choice bouquets can be customised to some degree using whatever flowers are available on the day. Either make a note of your preferred colours/style in the comments box when ordering online or telephone our Customer Service Team on +44 (0)1730 818 300 if you have very specific requirements. We can also do custom orders for special events, bulk orders and wholesale/trade quantities. Telephone our customer services team for custom bouquet orders or more information or, if it is bulk flower purchases you are after, here’s a link to our Trade Department. Although we strive to have a vase option for every bouquet on our website, due to box size constraints we’re unable to provide vases for specific arrangements sizes and flower types. My order has been processed, and/or dispatched. Can I change the flowers? Change the note? If you wish to make any changes to your order you may do so by e-mailing us using the form in the Contact Us page of our website or by calling us on +44 (0)1730 818300 a minimum of 24 hours in advance of the delivery date. This should allow us time to make the changes that you require, subject to the availability of flowers etc. We wish we could accommodate every situation and every request, but once an order is dispatched there is little we can do. Given that our product is perishable and must travel to your door within 24 hours, we cannot cancel or refund after the specified dispatch date which is always the day before the delivery date selected. If a recipient may not be home or similar, we can request a reroute to a different address by our courier but this may not always be possible and is out of our direct control. We will always strive to provide the best service possible, but we can't be miracle workers in these situations. Will you ever send me an arrangement that's different from what I ordered? We won’t switch your bouquet completely without attempting to contact you. However, we do reserve the right to substitute flowers with other colours or varieties if necessary and this is part of our terms and conditions. For example, if on dispatch day, we feel the quality of the flowers that you have ordered is not up to our high standards or, as sometimes happens, the weather affects the number of flowers that are ready to cut on our farms, we will make the necessary flower substitutions. In this situation, we will try to contact you to discuss alternatives. However we will always substitute flowers and ensure an arrangement of the same size and quality is delivered on the right day rather than not fulfil the order at all. Can I search for a specific flower type, colour, occasion or date? Yes! Use the filters located on our product pages to help you find the perfect arrangement for you. You can filter your results by any of the variables listed. We deliver on Tuesdays to Saturdays. For specific festivals such as Mothering Sunday or Valentine’s Day we may also offer a Sunday delivery. How quickly can I have my flowers delivered? We offer next day delivery if the order is placed on our website by 4pm. If you miss this deadline, we will do our best to accept telephone orders shortly after this deadline but this is subject to our courier collection time which does vary, so no promises! Please order by 4pm to avoid disappointment. Do you offer or local collections? You may collect from our workshop and save on the delivery charge! Can you deliver ‘Same Day’? We can offer same day delivery within a 10 mile radius of Petersfield. You may also like to collect from our workshop and save on the delivery charge! £8.50 per box to one delivery address. Please note: each delivery charge covers up to 30kg and can include multiple boxes. Orders over this weight will incur an additional delivery charge for each 30kg. As a guide, our bouquets are usually under 10kg each. Currently we deliver to most UK postcodes. However, there are exceptions in the highlands and Islands as it can take two days to reach by van and sadly this compromises our ability to guarantee the flowers for a full five days. Just like us, our flowers don’t like to spend any more than 24 hours in van! As a result, we are unable to deliver to:- AB37-38, AB41-56, IV1-20, IV25, IV30-37, IV63, KW1-3, KW6-10, KW14,PH15-26, PA21-35, PA37-39, PH33,49, IV21-24, IV26-28, IV40, KW5,KW11-13, FK18-21,PA36, PA40, PH30-32, PH34-41,PH50, HS1-9, IV41-56, KA27-28, KW15-17, PA20, PA41-49, PA62-76, PH42-44, ZE1-3 Northern Ireland, Isle of Man, Jersey, Guernsey, Scilly Isles. For customers looking to deliver to Isle of Wight we are now able to offer this service for telephone orders only. Please contact our Customer Services team on +44 (0)1730 818 300 and they will give you the delivery costs for standard and premium delivery. We do not deliver flowers to any international markets, but never say never. It may happen in the future! If you would like to send non-perishable items then please call us +44 (0)1730 818 300 to order and we can arrange to get these throughout the UK and internationally (subject to international delivery charges). Does somebody have to be there to accept the delivery? The Real Flower Company offers one delivery option - No Signature Required (except for deliveries that include alcohol and require an adult signature). This means that our courier partner will make an attempt, but not guarantee to notify the recipient before leaving the bouquet. We recommend you use the comments section on the checkout page which allows you to suggest a suitable place for the courier to leave the flowers if the recipient is not home. The flowers will, by default, be left on the step if possible or with a neighbour. If you would prefer that the flowers are not left on the step or with a neighbour. but re-delivered by the courier then please specify this in the comments section. In this instance, a card will be posted through the letterbox and the recipient will need to telephone the courier depot to arrange for re-delivery. Please note that the courier will not call the recipient to ensure they are at home before delivery and if the re-delivery results in the flowers being delivered a day or more late, then our five day guarantee is no longer valid. What happens if the recipient was not home at the time of delivery? All good. The flowers will, by default, be left ‘safe and dry if possible, or with a neighbour. If you would prefer that the flowers are not left outside, or with a neighbour but re-delivered by the courier, then please specify this in the comments section when ordering. In this instance, a card will be posted through the letterbox and the recipient will need to telephone the courier depot to arrange for re-delivery. Please note that the courier will not call the recipient to ensure they are at home before delivery. If there are any issues with the delivery of your flowers, feel free to contact us and we will be happy to help! How do you ship flowers directly from the farm? How do they stay fresh? When shipping from our Fairtrade farm in Kenya, our flowers remain in a cool environment or cold storage. This means that the flowers are kept in a state of sleep for most of the time which keeps them really fresh. We package them carefully at the farm to protect them during travel to our workshop where they arrive in optimum condition to be hand-tied by our florists and dispatched for next day delivery. It is not possible for our flowers to be temperature controlled once we have dispatched them so it is ideal if someone can be present when they arrive in order that they can be placed in a cool dry place as quickly as possible. When shipping from our English farms, the flowers can be delivered within 24 hours of being cut! I placed an order in advance - are my farm-fresh flowers going to be picked and dispatched early? We make our bouquets with the freshest of hand-picked flowers available on the day of dispatch to keep the time between our farms and the recipient’s doorstep to an absolute minimum. Invariably, this is a significantly shorter period than ordinary commercial flowers which often stay in cold storage for up to 10 days! Do you guarantee delivery on specific dates? You can specify a particular delivery date and we will do our best to deliver on that exact date. However, because we deliver using a courier and do not directly control their operations, we cannot "guarantee" delivery on a specific date. In addition, things happen. Acts of God or Nature such as severe weather that causes delays, wrong addresses or non-existent ones (don’t ask!). My order didn't arrive by a certain time or a time that was convenient for me. I want a refund, or you to give me something free? Please note that our courier controls your package once it has left us. Whilst we strive for amazing service, we cannot control our courier partner’s operations. We cannot guarantee a certain time of the day (other than before 1pm for our Premium Next Day service), or provide refunds for providing a bouquet a few hours earlier or later than the specified, or your ideal delivery time. If in the rare instance we happen to be late by a day, please contact customer service. Can I use a promotion that starts after or finishes before I place my order? The Real Flower Company reserves the right to extend and/or stop any promotion at any time. Discounts, Promotions, and Voucher Codes or Store Credits of any kind may not be combined with any other offer or applied for orders made before or after the specified promotional period under any circumstances unless at the sole discretion of The Real Flower Company. Inputting a voucher code will apply an automatic credit to your order. To use the voucher code, “Add Promo Code / Vouchers” at the Basket stage of checkout, input the code and click “add” for the credit to apply to your purchase. If a Store Credit does not show after you input your code, please contact Customer Service. We accept MasterCard, Visa, Switch, Maestro, Solo, Delta cards and America Express. What is your refunds or credits policy? In the unlikely event that your flowers arrive damaged please notify us within 24 hours. We guarantee our bouquets for up to 5 days and send the flowers with care instructions to ensure they are placed in the optimum environment. However, if they fail to last for five days please do send us an image within four days of the delivery date. We offer a no quibble refund or replacement policy but we do ask for an image so we can look into any issues thoroughly. If it is our error, we will also consider a credit for deliveries on the wrong day, or the delivery of incorrect items except where flowers have been substituted due to availability in accordance with our terms and conditions. What sort of things do you not offer refunds for? We do not offer refunds or credits for things that are out of our control such as Acts of God or Nature such as severe weather that causes delays, wrong or non-existent addresses and minor blemishes on flowers, or a dropped petal or two. In the unlikely event that your notecard is missing or incorrect, we will be happy to send a personal, handwritten card to your recipient, and we'll provide a partial Credit Voucher for the inconvenience but not a full refund or resend. Our head office is open from 9.00am to 5.00pm Monday to Friday. If you have a query or request please call us on 01730 818 300.